Brazilian elodea has dense whorls of 4-6 leaves growing from submersed stems. Under magnification fine serrations are visible on the blade-shaped leaves. Unique double whorls, known as double nodes, occur along the stem wherever it branches. White, yellow-centered flowers grow on stalks from leaf axils to the water surface. Brazilian elodea is native to South America. It was introduced to the United States as an aquarium plant and is now present in many states including New Hampshire, Vermont and Massachusetts. 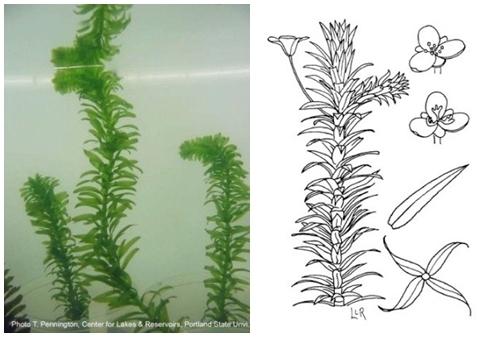 Although Brazilian elodea resembles hydrilla it does not produce tubers. Its only means of reproduction is from plant fragments containing a double node.